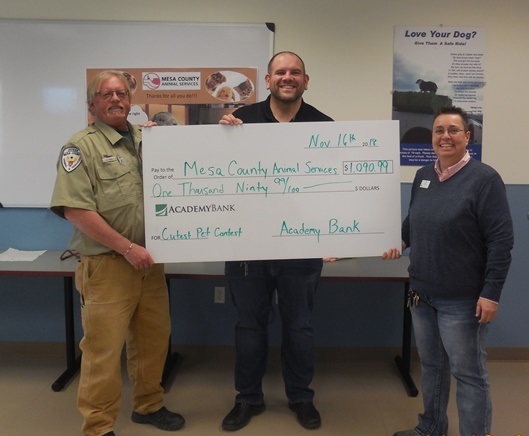 Mesa County Animal Services Manager Doug Frye (left) accepts a donation from Academy Bank from proceeds raised from the Cutest Pet Contest that they recently had at the Rimrock Walmart. The funds will be used in the Project PUPs fund for the citizen's of Mesa County to spay or neuter their pets at participating veterinary offices. Mesa County Commissioner Rose Pugliese had a very special visitor stop by to learn about county government. The six-year-old Daisy was excited to learn what a county commissioner does. Two Daisies learn about what is like to be an elected official, perhaps they will be inspired to run for office in the future. Mesa County Treasurer Janice Rich (left) and Mesa County Clerk and Recorder-elect Tina Peters (right) talk to the Daisies about local government. Clerk to the Board Lori Westermire presented her last liquor license at the public hearing Monday, Nov. 19. Lori left Mesa County and has moved on to a new adventure. Best wishes, Lori! Election and Recording Manager Tim Long runs the computer while Risk-Limiting Audit board members Maria Keenan and Deborah Gaul perform the audit. Staff members Rebecca White and Lily Thorpe supervise! 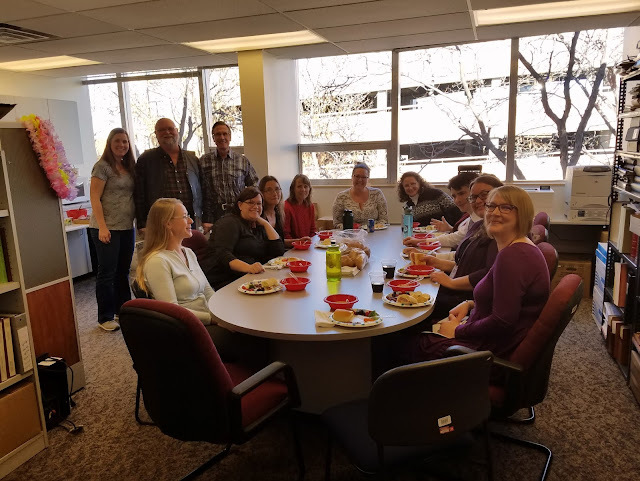 Human Resources and Finance personnel, along with County Administrator Frank Whidden and Commissioner Scott McInnis celebrated Thanksgiving at a potluck over the lunch hour. HR Administrative Assistant Cori Armstrong (right) smiles during the HR and Finance Thanksgiving potluck. 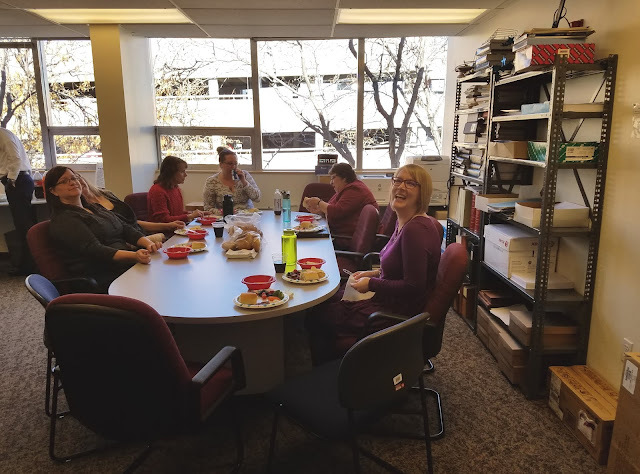 Criminal Justice Services hosted a chili cook-off, Wednesday afternoon. The CJSD Employee Activity Team thanks everyone who participated in this year's chili cook-off. Sixteen employees participated this year, which is the biggest turnout they've had for this event since it was started in 2012. Pictured, from left to right, Shawn McNamara, Charles Kitto, James Bruner. CJSD personnel enjoys a variety of chilis on a cold, chilly day. Sixteen different types were entered into the competition. CJSD Quality Assurance Coordinator Eileen Wygant searches for the perfect music to play during the chili cook-off. Meet the chili cook-off judges (from left to right): Dennis Berry, Jim Robbins and Cindy Barnett. It's time for the judges to deliberate and they are taking this competition very seriously. All judges have been extremely thorough with their scoring, especially Dennis Berry, right. CJSD chili cook-off first place winner: Dave Wetherald (right). Congratulations, Dave! CJSD chili cook-off second place winner: Jennifer Wells (right). Jennifer won second place for her delicious green chili. CJSD chili cook-off third place winner: Nick Brutosky (left). Former CJSD Director Dennis Berry congratulates Nick for taking third place. Nick was also the Master of Ceremonies (MC) for the event. CJSD chili cook-off fourth place winner: Connie Robbins (left). A special thanks to Connie for helping coordinate the event. 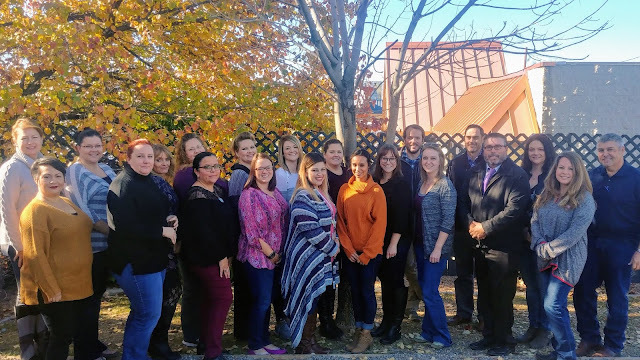 2018 Department of Human Services and Workforce Center Leadership Institute graduates stand alongside their division directors. Congratulations, graduates! 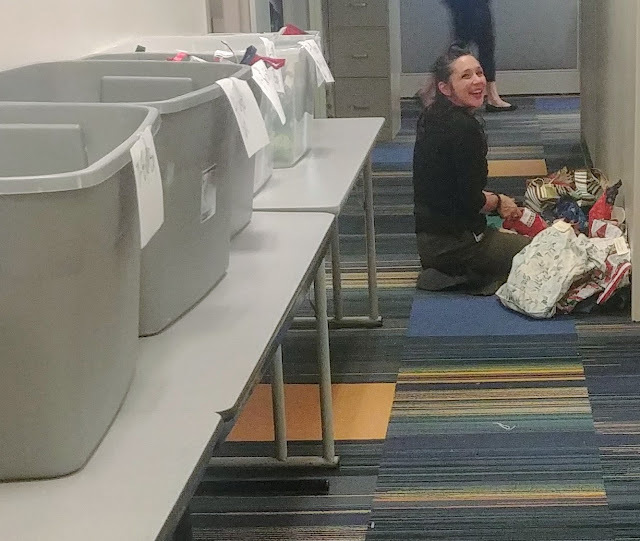 Placement Resource Manager Kylie Mayfield is all smiles while stuffing stockings for foster care children in Mesa County. 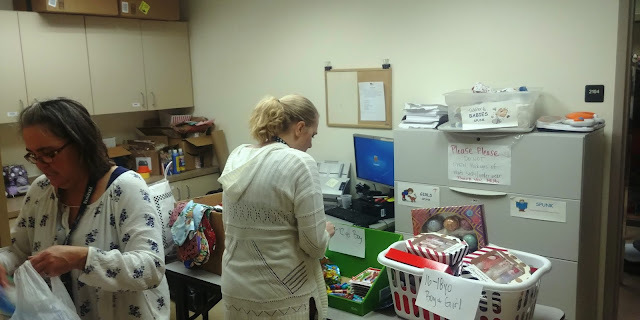 DHS Supervisors Laura Kinson and Sarah St. Martin organize goodies for the foster-kinship stocking stuffing event. 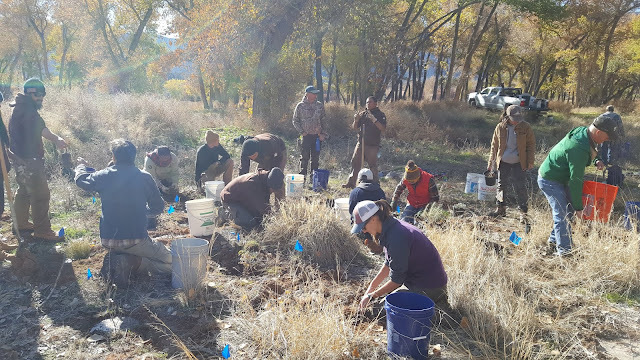 Mesa County Noxious Weed and Pest Management joined RiversEdge West, Canyon Country Youth Corps, Gateway Canyons Resort, Gateway School, and community members as partners in the Dolores River Restoration Partnership and planted new native plants in an area that had been cleared of invasive species tamarisk and Russian olive. 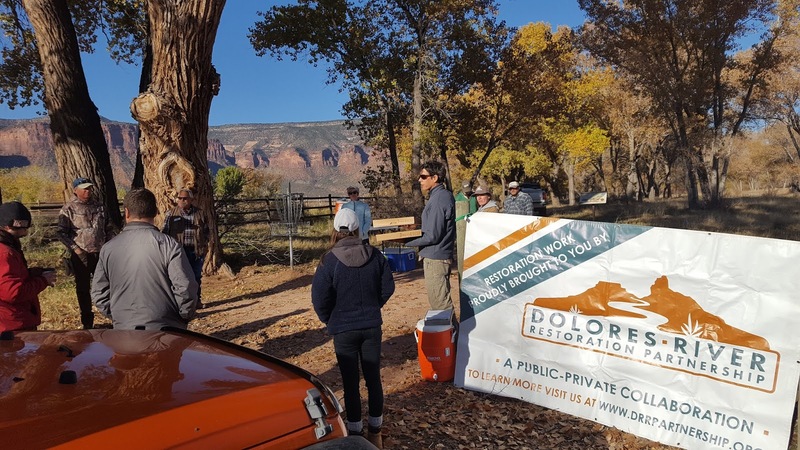 Mesa County Noxious Weed & Pest Management and other members of the Dolores River Restoration Partnership gather near the river in Gateway to discuss the work that has been done over the last 9 years to restore the health of the Dolores River riparian corridor. 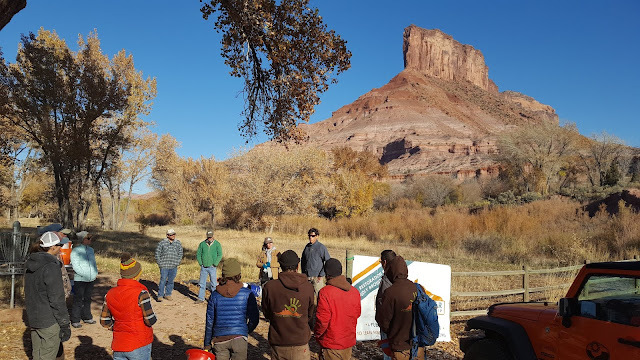 Canyon Country Youth Corps members and other participants get ready to plant and water some new native species along the Dolores River in Gateway. Kate Lunz with Noxious Weed & Pest Management prepares to plant another native shrub to replace the invasive species tamarisk and Russian olive that has been removed recently in an effort to create a healthier riparian corridor along the Dolores River. 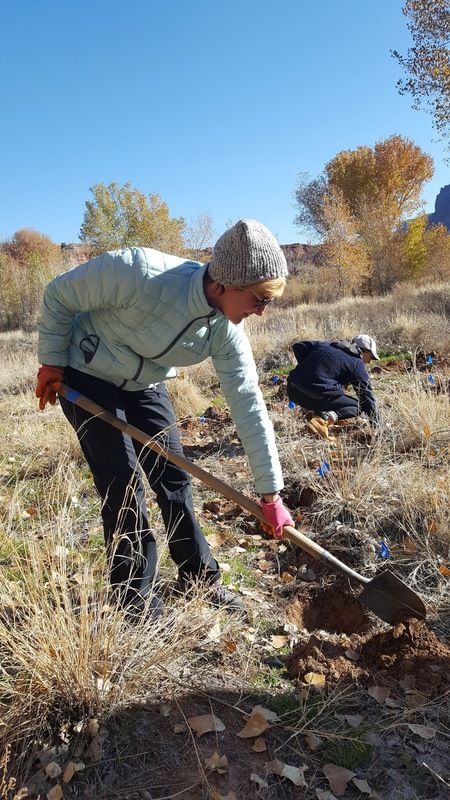 Dolores River Restoration Partnership organizations including Mesa County, RiversEdge West, Canyon Country Youth Corps, Gateway Canyons Resort, Gateway School, and community members plant and water 120 native shrubs and grasses along the Dolores River near the disc golf course in Gateway. From left to right: Mesa County Commissioner Rose Pugliese, Logan County Commissioner Byron Pelton and Rio Blanco Commissioner Shawn Bolton at CCI Foundation's winter conference. 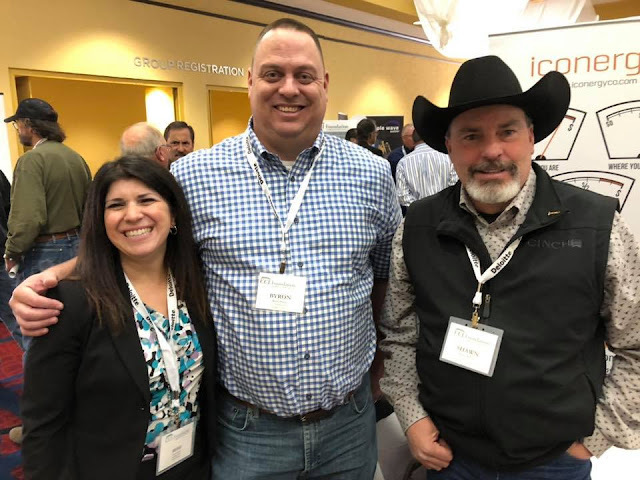 Over 400 commissioners and other county officials from across the state met in Colorado Springs, Colo., Nov. 26-28 for Colorado Counties Inc. (CCI) Foundation's annual conference. The conference featured meetings on the opioid epidemic, Gallagher Amendment, landfills, and other vital issues affecting Colorado counties. Mesa County Treasurer Janice Rich stands alongside her staff. From top to bottom: Judy Vopel, Michelle Staples, Heike Buenning, Amy Bosse, Christine Horner. Janice Rich will be leaving the Treasurer's Office Friday, Dec. 7, to start her new role as Colorado House Representative for District 55. 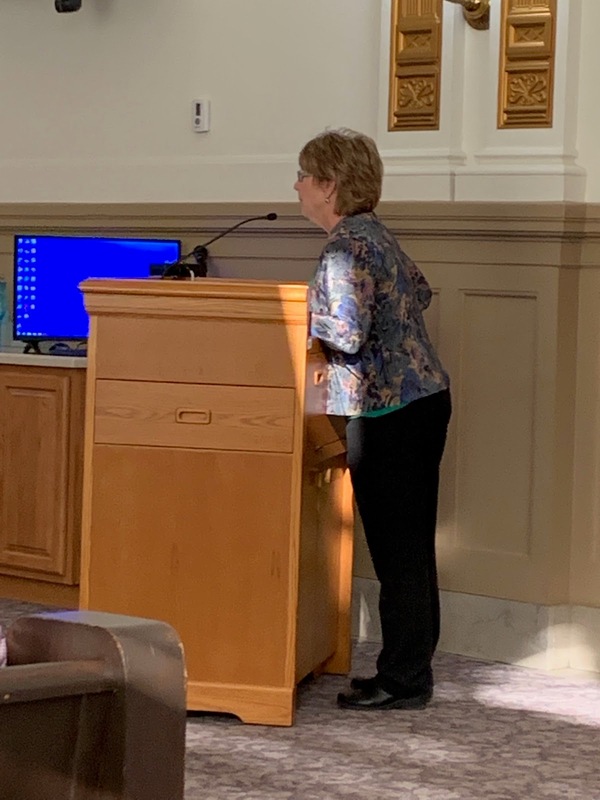 Here is a statement from Janice Rich, "Well, my time as Mesa County Treasurer is coming to an end as of December 7, 2018. Sixteen years in local government (8 as your Mesa County Clerk; and 8 as your Mesa County Treasurer). 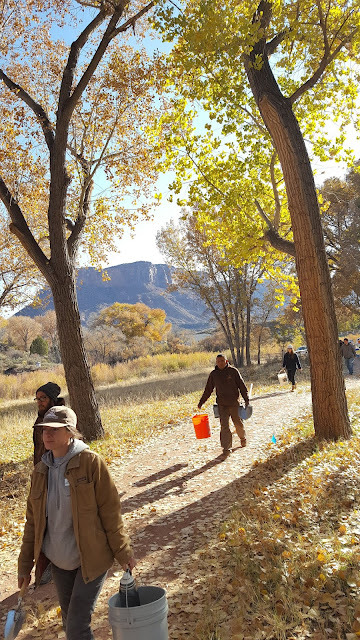 Many thanks (several times over) to the people of Mesa County! It has been an absolute privilege to serve and work with fine people in Mesa County. My next journey--the Colorado State Legislature!" Congratulations, Janice! 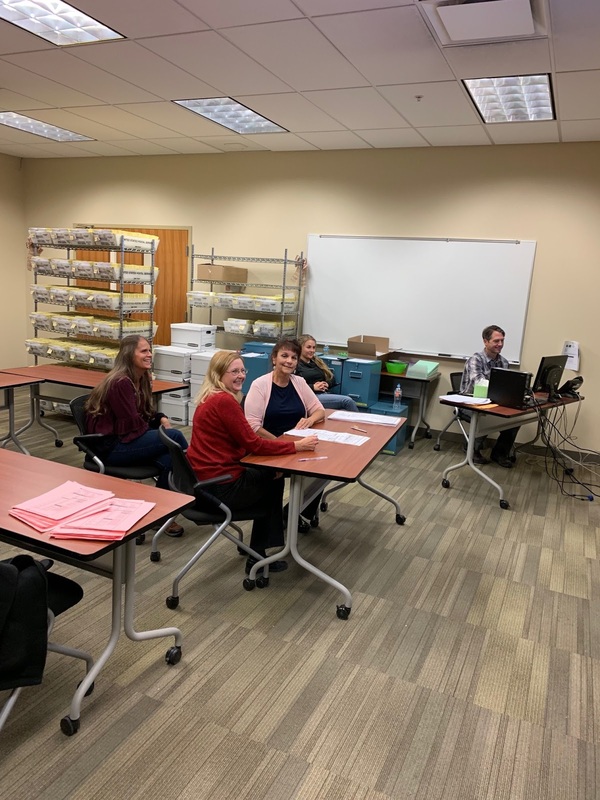 Mesa County Clerk and Recorder personnel wrap up for the day Thursday evening. Mesa County Clerk and Recorder Sheila Reiner stands in the Motor Vehicle lobby after hours one last time before she leaves her role as Clerk and Recorder to assume her new role as Mesa County Treasurer as of 5 p.m. on Dec. 7. Congratulations, Sheila! Mesa County Clerk and Recorder Sheila Reiner gathers her staff for a group picture Thursday evening. And, of course, the picture would not be complete without their mascot Flash (the fastest sloth working at Zootopia's DMV—Department of Mammal Vehicles). Mesa County Clerk and Recorder and soon to be Mesa County Treasurer Sheila Reiner is surrounded by her staff for one last group picture. Did you notice Flash took off his glasses for the picture? Mesa County Clerk and Recorder Shiela Reiner thanks her staff and residents for their support. Here is a statement from Sheila Reiner: "What a wonderful 17 1/2 years it's been working for the Clerk's office with 8 of it being your Clerk & Recorder - I've TREASURED every minute of it!. I will be your Treasurer beginning December 10th. Thank you Mesa County for allowing me to serve and contributing to the office and the journey. We have made a lot of progress under trying times at the county - together!" Rumor has it, Network Administrator Josh Dallman turned 62-years-old, on Dec. 1. 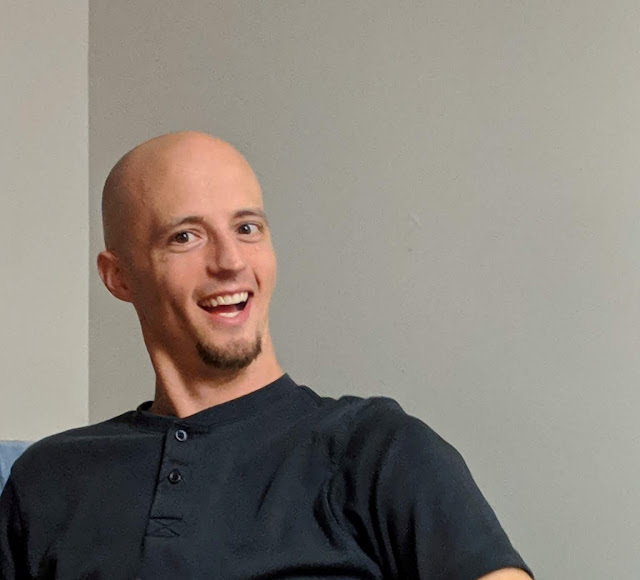 Happy birthday, Josh! We know that rumor is a lie. Per Eric Farslow in Information Technology, this is what happened to an employee who was waiting for a response on their help desk ticket. Mesa County Clerk and Recorder-elect Tina Peters was sworn in as interim Clerk and Recorder Friday morning. Tina Peters is assuming her responsibilities as Mesa County Clerk and Recorder a little over a month early and will be officially sworn in on Tuesday, Jan. 8, 2019. Congratulations, Tina! 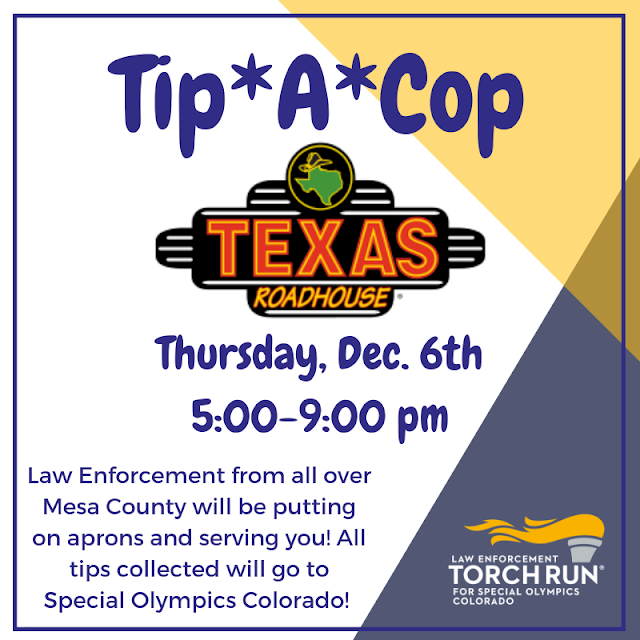 Help Mesa County law enforcement raise money for Special Olympics Colorado. Treat your family to a meal or dessert at Texas Roadhouse in Grand Junction. Deputies and other law enforcement will be there serving and collecting tips for Special Olympics Colorado.